New Year’s is celebrated in a variety of ways all around the world. Some people eat special foods, wear certain clothes, make resolutions, or engage in other traditions. It is most common to ring in the New Year with enthusiastic hopes for good luck, love and prosperity, among other good fortunes. Here we’ve highlighted a few of our favorite New Year’s traditions from around the globe. 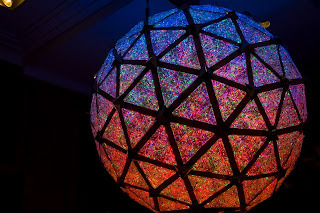 United States – The U.S. New Year’s tradition is the dropping of the crystal ball in Times Square in New York City at 11:59 p.m., Dec. 31. At midnight it is common to make a toast with champagne and to kiss your significant other. Many people create New Year resolutions in hopes of making positive changes for the new year. France – The New Year's in France is referred to as, “la Saint-Sylvestre.” Champagne or sparkling white wine is the drink of choice to share among friends on New Year's Eve. 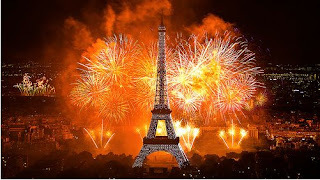 The Eiffel Tower is illuminated with spotlights and a renowned fireworks display is set off at midnight. 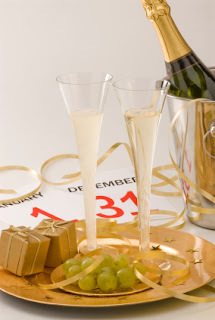 Spain – The long-standing Spanish ritual on New Year's Eve is to eat twelve grapes at midnight. The tradition is meant to secure twelve happy months in the coming year; sweet grapes represent good months, while sour grapes imply difficult months. Brazil – The New Year in Brazil, or “Ano Novo,” marks the beginning of the summer holidays. It is tradition to wear all white and gold or silver. 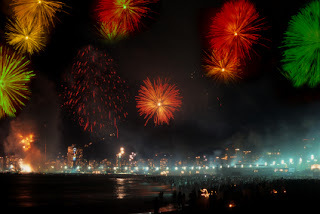 Rio de Janeiro is regarded as the location of one of the best fireworks displays in the world during New Year’s Eve along the Copacabana beach. Japan – Considered one of the most important holidays, many business shut down from Jan. 1 – Jan. 3 in Japan to celebrate New Year's. Many people visit shrines or temples. It is also tradition to eat buckwheat noodles - a food that symbolizes longevity. Each new year provides a fresh start and is considered a time of renewal. What traditions do you follow to ring in the new year? Be sure to stay tuned for the blog post coming this Friday that features our top 10 beauty resolutions for 2012! In Italy to celebrate the new year we eat lentils representing luck and money. In Scotland we call Dec 31 Hogmanay, it is tradition for your "first foot" the first person to cross your door to have a lump of coal for good luck!